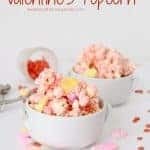 Pretty in Pink Valentine’s Popcorn that is quick, easy and perfect for a party. 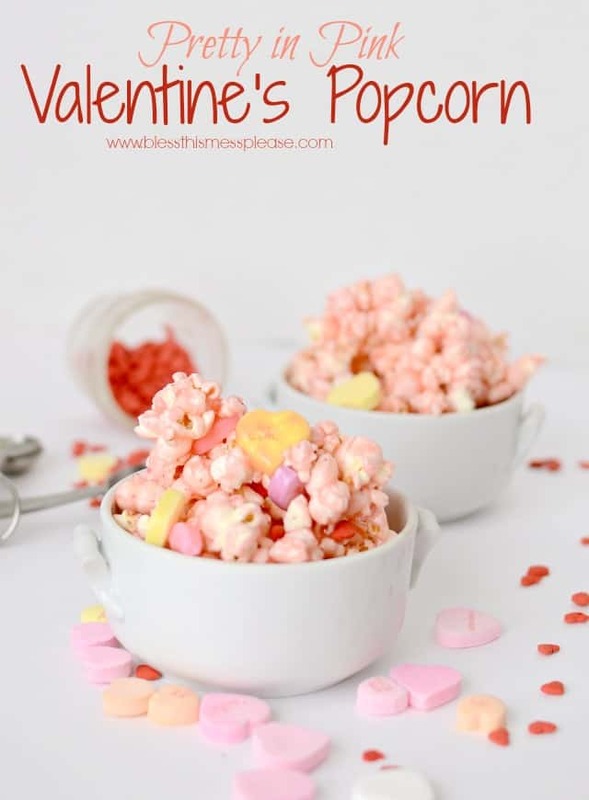 Today I’m sharing a lovely and delicious Valentine popcorn treat. It’s quick, easy, super cute, and makes a big batch. This is the perfect thing to bring to a party, make for your kids to enjoy after school, or divvy it up into those fun little cellophane bags to surprise your neighbors. This popcorn is sweet and sticky. It has conversation hearts and sprinkles hiding in it, and it’s a lovely shade of light pink. Things that are sweet, pink, and full of hearts are always a good thing in my book. Now all you have to do it decide when you are going to make it! Store any leftovers in an airtight container. This lasts a few days but is better eaten on the first day you made it. 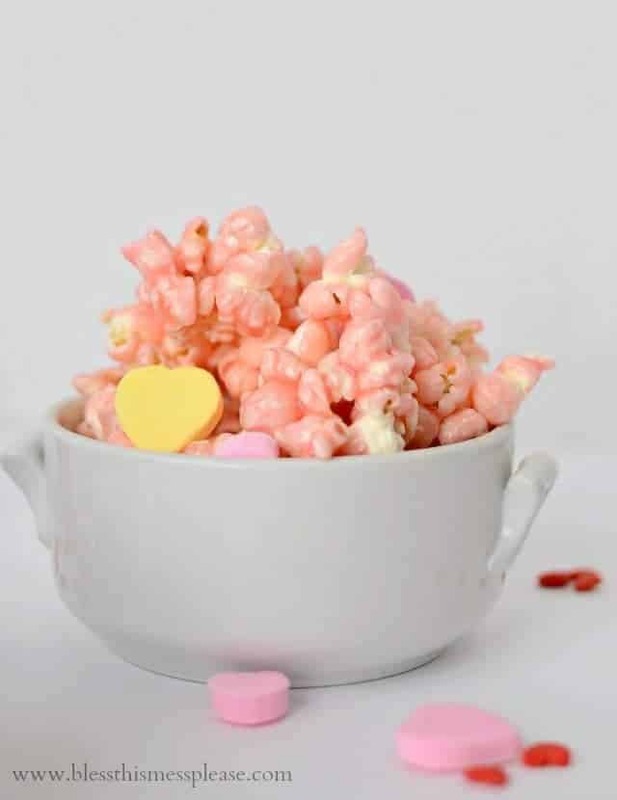 Because you are tinting the popcorn, you could really change up the color and use this for any occasion! 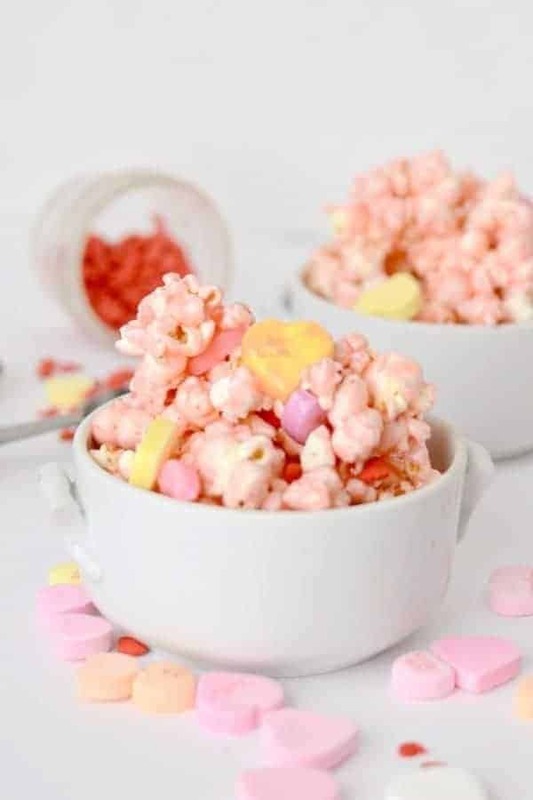 Just swap out the candies and sprinkles for something more seasonal and you have yourself a great all-purpose popcorn recipe! 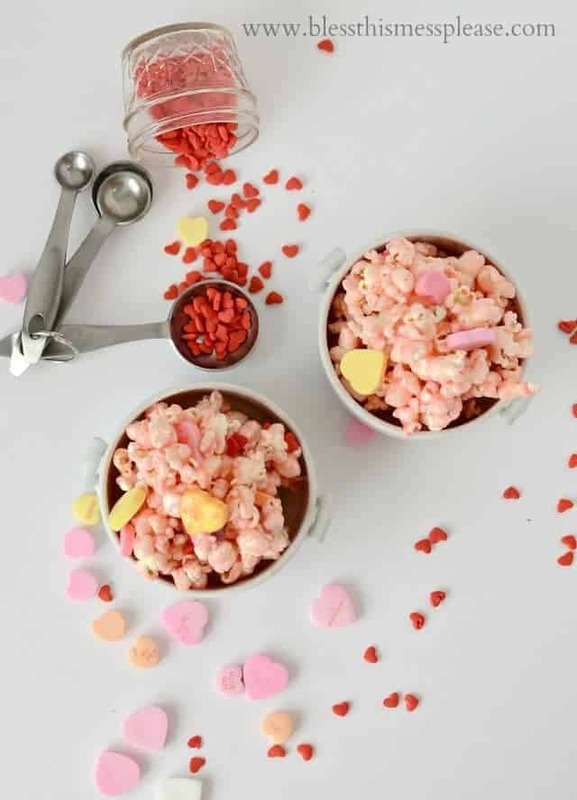 In a large bowl mix the popcorn and conversation hearts together and set aside. In a medium sauce pan over medium heat combine the sugar, corn syrup, and butter. Cook over medium heat until the mixture comes to a boil. Stirring often let the mixture boil for 3 minutes. Remove from the heat and stir in the salt, vanilla, and food coloring. Pour the sugar mixture over the popcorn mixture in the bowl and stir well until everything is evenly coated. Turn the mixture onto waxed paper and then sprinkle on the heart sprinkles before the coating cools. Let the popcorn cool completely before enjoying. I love this! My grandchildren and I are BIG popcorn eaters. This is so pretty and the candy is great. Going to pin it now. Thanks! This is SO cute! I may make this for my neighbor’s 2 children! She has been so sweet to me and shoveled my snow for me, and made me Christmas cookies! This would be a nice treat for her kiddies! Everyone in my House loves popcorn including me! This recipe sounds so Valentines Day ready!! I will try this sometime for my annual valentines day party at my sisters. I will pin and thankyou so much for sharing..
My girls love popcorn! Can’t wait to try this with them.